According to criteria in a study conducted by the UN, people living in more developed countries can count on more living space than their deprived human fellows. The theoretical minimum of the floor area is set to 20 square meters per person. 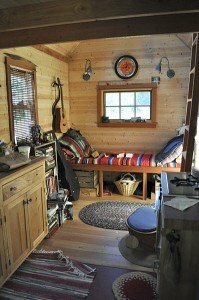 So, a tiny home is considered every home in which every person does not have at least 20 square meters, including all the rooms in that home. Living in such a place and decorating it is a real challenge, so let’s make it easier by sharing some interesting and practical ideas for small home decoration. This is the age of efficiency and evaluation. Housing is definitely fertile ground for these trends. Nowadays governments bring strict regulations for energy efficiency, and apartment owners have to pay a lot of attention to these aspects of their homes. The smaller the home is, the easier it is to keep it maintained in an efficient way. In the light of thermal efficiency, every small home owner should consider getting a pellet stove. Although the initial investment is a bit higher than old-school radiators, it is a true frugal choice for those who want to have an efficient and warm home over a course of years. Here is a great article on buying income properties. Have a look at the pellet stove buying guide. The combination of colors is of crucial significance for every tiny home, no matter if it consists of a few separate areas or only one single room. If your lounge area has enough daylight, you can go with some less aggressive, but still vivid, colors to create a contrast. On the other hand, darker living rooms will have to be enriched with bright, space-opening colors, such as lighter shades of red or the peachy color. The kitchen area should go as light as possible, since such color tones boost creativity. Finally, the bathroom can be decorated with contrasting colors and shades. If you home is tiny, you bathroom must be minute, so try to play with it to create a cozy bathing area. Also, you might want to get more inspiration from a color scheme for small homes posted on the This Old House website. The ironing board is a pretty annoying item even in larger apartments. Now imagine that you have to find enough space to accommodate your ironing board, a mirror, a dining table, and other necessary furniture items in, say, 18 square meters. Luckily, people are a creative species, so there is a type of furniture called folding furniture, some of it you can find on antiques world website. Those pieces can easily change their shape, which makes them perfect for tiny homes. For instance, the ironing board from the beginning can also serve as a mirror. You should only add a mirror to one side of the board, install hinges at its bottom and fasten the board to a wall. Whenever you need to iron your clothes, you simply put the board in a horizontal position and you have a genuine ironing table. Instantshift has some additional solutions with folding furniture items. Every home has to meet some basic safety and health regulations. Since tiny homes look more fragile than their larger counterparts, they need to be looked after in a more detailed way. For instance, you should make sure that your place is equipped with safe front doors and a few safety cameras. This is especially a must for remote houses in the countryside. When talking about homes in the country, it goes without saying that every such home needs to have proper anti-bug devices, like professional pest control supplies, to prevent insects and mice from infecting the area. Smaller homes can give you a great feeling of coziness and togetherness, especially if you have a family. Decorating a smaller house can be quite difficult as you need to utilize your space very well. If you can fit a white coffee table in the planning please do, as it looks very stylish. We hope our ideas will help you make your little home a charming and pleasant place. ← Are Natural & Organic Cosmetics Just A Con? Rocket heaters or rocket mass heaters are a very good option for heating. The radiant surface can be beds or sitting benches. These use about 1/10 the amount of wood as a regular wood stove, to produce the equivalent heat output.